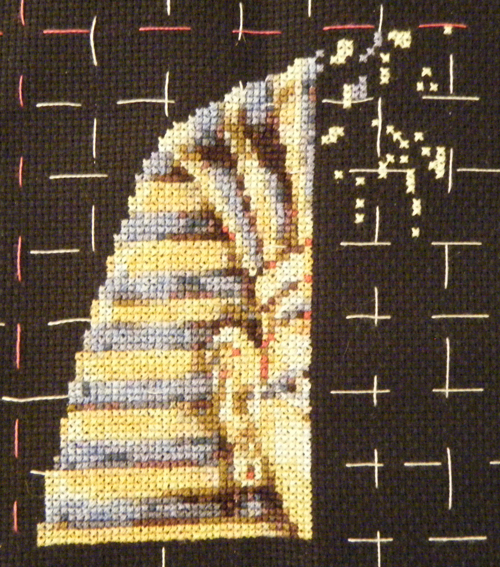 Regular readers may be relieved to hear, that I’m really enjoying stitching King Tut, which given our history is a bit of relief! The chart comes on 6, A4 pages and I’ve completed the first of these (top left). Now I’m classing that as having finished 1/6th of the design but the truth is that the 4 “corner” pages actually have quite a bit less stitching on them than the 2 “inner” pages which are pretty much stitched on every square of the chart. So once I’ve completed the next page, then I will truly have finished a third! I have a few days off work over the next week and DIY allowing, I’m redecorating the Hall and maybe the Kitchen… then I plan to stitch for a few hours each day. So by the end of next week there should have been some reasonable progress on this. It builds up quite quickly considering how many confetti stitches there are in it. Not mention the thread changes. I’m wondering if it may be worth trying either the “parking” method, where you leave the thread in the fabric ready for the next time you need it rather than starting and ending each time. Or whether I simply have lots of needles ready threaded so I can switch and swap about more quickly. I’ll have a go and let you know which works best for me. In the meantime, here’s the latest update photo of King Tut. I’ve been cross stitching since my early teens some 35 years ago. I love to share my cross-stitching adventures which is what my blog is all about; an insight into my cross-stitching world. Please feel free to join me if cross-stitching is your passion. Thank you, it’s taking a bit of stitching but I’m pleased with it so far. Ooh that’s looking pretty. I too have a King Tut that I’m working on and it feels like slow going but I just know it’s going to look amazing when it’s finished. Thanks, good luck with your King Tut, me and mine have something of a complicated history, but we’re getting there now! Mine has a bit of a history too. It’s lived in 5 houses, I’ve graduated, had 5 jobs, I’ve got married and celebrated 8 birthdays. I’m determined to finish it this year.